Elliptical machines are a popular alternative to treadmills. 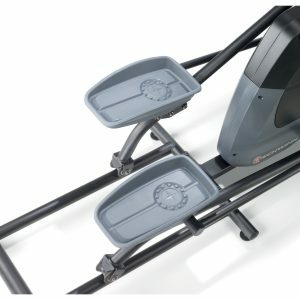 The main attraction of an elliptical is its smooth continuous motion that gives you the benefits of a weight bearing aerobic exercise, burning calories, building bone density with none of the stress of the pounding on the knees, back or hips that you might experience while using a treadmill. That is because forward or reverse, your feet never leave the pedals. An elliptical actually gives you a low perceived rate of exertion, which means that it will not feel like you are working as hard as you actually are. 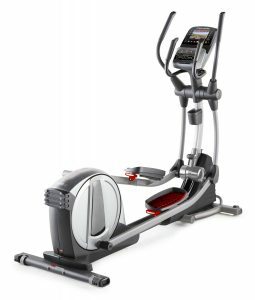 When comparing ellipticals, you should know that a heavier flywheel and a larger brake will provide the smoothest motion. 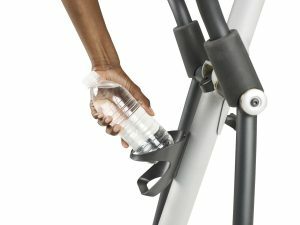 Look for large pedals that are closely spaced and pivot as you exercise. This creates a natural, comfortable walking motion. You may also need to consider the amount of space required for the elliptical machine. You may consider the following factors before buying an elliptical for home use. The flywheel is what gives an elliptical trainer a very comfortable and natural motion and depending on the weight of the flywheel, the motion can be very jerky or very smooth. The flywheel on an elliptical trainer can be at the front, middle or back. A flywheel on the rear creates a longer machine that takes up more floor space. A front or mid mounted flywheel makes for a compact machine. 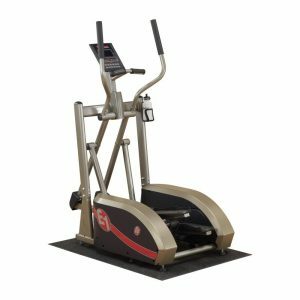 Rear drive ellipticals were the original ellipticals but now increasingly, front drive ellipticals tend to be making it to the marketplace and have become more popular. Rear drive elliptical feels like it is bouncing a little more up and down whereas front drive ellipticals have more of forward backward motion. Therefore, a front drive elliptical feels like it is moving a little more in a linear fashion. The stride length is another factor you should consider. The ideal stride length is 18 to 20 inches. Some elliptical have shorter stride lengths as little as 7 inches. 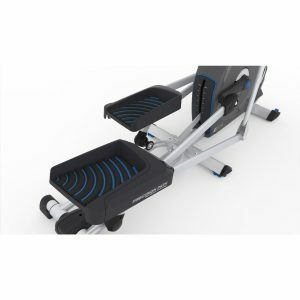 These usually restrain the elliptical motion making it feel bouncy or choppy and tend to give you an up and down motion similar to stair stepper machines. 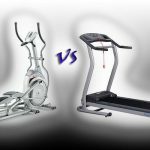 When you look at more expensive machines, you will notice that the stride length stretches out and you have a more elliptical stride rather than an oval stride as with the cheaper models. If you are very short then you may consider a shorter stride length like around 15 to 20 inches. If you are very tall then you may want to look for something like greater than 22-inch stride length. Just ensure you select a model with a heavy enough weight limit. The max weight limit also indicates the robustness of the machine. You should also keep in mind the space at home where you plan to use your elliptical. While there are a few that have a compact design, most tend to be as long as a couch. You need to think about the ceiling height as well. Some elliptical machine models can be folded when they are not in use. Others have wheels attached for easy transport and storage. 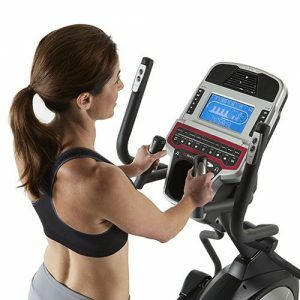 Other features to look for in elliptical machines are the grip mounted heart rate monitors and large informative LCD displays. In the control panel, you would want controls that are easy to use and easy to understand. It is not necessary to have a heart rate monitor built into the machine. Most machines do have a heart rate monitor, and the sensors for measuring the heart rate are usually located on the stationary handgrips. In that case, sometimes it is a little difficult to get an accurate heart rate because your hands are moving around or they may not be on the sensors as you are using the machine. For accurate heart rate measurements, it is recommended to wear a chest strap heart rate monitor sensors. 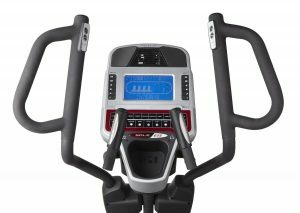 Good ellipticals or cross trainers will have a broad range of resistance to challenge all fitness levels and encourage muscle toning. Some models feature up to twenty levels of electronic resistance and have built-in speakers with a music player dock. You would also want an elliptical that either has the ability to incline the elliptical stride or has a variable elliptical motion. As you increase the angle of incline, it gives you a more intense cardio workout like walking or running up a hill. Also this will help you to work different parts of your lower body. If you want to add intensity or tone to different muscle groups, consider an elliptical with an incline ramp. You would want an elliptical trainer that is stable and sturdy. As you increase the resistance levels of an elliptical machine, it may require that you hold on the moving handgrips to keep it moving. This can cause the machine to become unstable or maybe even tip over. Consider a heavier weight machine with a more comprehensive warranty that will stand up to increased usage. One of the things you do not want to have is a machine that makes clunks or grinding or loud noises while working because these are things that you will have to listen to or deal with every time you use the machine. So you should make sure that it feels good and sounds good. You would also want the foot pedals to be large enough to fully support your feet and have a surface that has some sort of non-slip material or texture to it so that your feet do not slip when you are pushing hard on the pedals. This type of action lets you choose backwards or forwards motion. Some other optional features to look for are incline control, heart rate control, one touch resistance, built-in speakers, programmable exercise routines, built-in fans and water bottle holders. These types of elliptical machines do not have movable arms. They may or may not have fixed arms to which you hold on during your workout. The fixed handgrips help you give support for balance. If you have good balance you may also keep your arms by your side and mimic a running motion, which will help you burn more calories. However, in view of your safety it is recommended that if you do need to hold on then use the fixed handgrips on your traditional elliptical machine. Many models have an adjustable ramp to increase or decrease the incline angle. 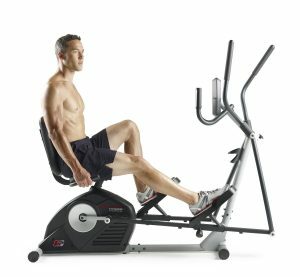 In a cross trainer, you usually have movable arms for upper body workout at the same time. 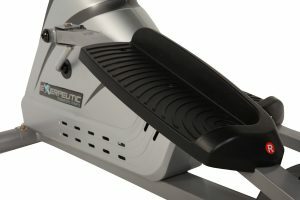 The ramp angle is usually not adjustable in elliptical cross trainers. 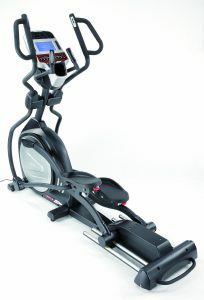 Also known as a hybrid or 2-in-1 elliptical, the dual function elliptical trainer also works like an exercise bike. These compact, space saving trainers usually come with an adjustable seat. Working on an elliptical is a fun and effective way to exercise indoors. Elliptical trainers provide an amazing low impact workout and are joint friendly. Working with an elliptical gives all the benefits associated with cardiovascular exercise such as burning calories, strengthening heart muscles, endurance, etc. 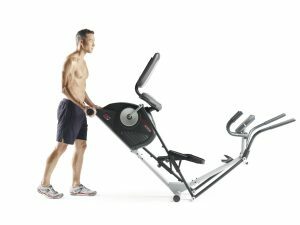 An elliptical gives you an opportunity to get multiple workouts on one machine. You can use the handlebars in cross trainers for upper body movement, so it becomes a total body workout, upper and lower at the same time. You also have the option to increase the tension for simulating hills or helping you get that heart rate up. The exercises on an elliptical machine benefit your lower body muscle groups and glutes similar to walking. 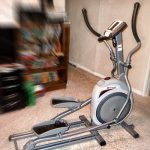 Elliptical machines have moving parts, so when you first step on an elliptical you should be prepared. Once your feet are secured on the pedals and you have your hands on the handles, start moving your feet forward. The machine will begin to move in a rhythm that follows an elliptical pattern. Remember to start out slowly. You can start with a medium resistance, increasing the resistance as you go along, and add more power to your movements later. The proper posture on an elliptical would be just how you would stand upright as if you were standing on something that required a little bit of stability. 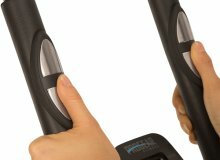 The better way to approach an elliptical machine would not be holding onto the handgrip or arms. The reason for that is once you are holding on, you are kind of leveraging your way with your upper body which forces you into an improper posture or poor body movement. You are putting your way forward, not giving much pulmonary expansion and putting inappropriate load on your knees. That could hurt a lot. Therefore, we want to put a little bit of posterior load and be upright and let go as much as we can. Once we build that stability, we will get a little bit of a core workout. You will notice that some elliptical have moving arms and some do not have arms. It is really up to you on which type you prefer. If you would like to get an upper body workout as well, obviously you are only going to get it if your resistance is a little bit higher and therefore an elliptical with arms would be appropriate. The elliptical without arms are fine if you are just looking for interval training or long sustained cardio with just the leg workout. To stop your workout, simply slow down your movements until the machine comes to a stop. Always consult a physician or a healthcare provider before beginning an exercise program. Not entering your information on the elliptical computer is one of the common mistakes people make while working on an elliptical. By entering your age and weight before workout, will make the calorie burn calculations more accurate. Never equate the calories burned shown on the machine display to something that you can go and eat. Do not set the resistance to zero. By lowering your resistance, you will not work your muscles hard enough and you will not see the results you should be getting. Not standing in an upright posture, while working on an elliptical is another mistake. If your posture is correct, you will be able to work your core abdominal muscles that will help you burn more calories. You should change your direction of motion during workout – forward and reverse. If you do not change your direction on the elliptical, then you are not working all the muscle groups in your legs. By shifting your motion backwards, you can actually shift the weight more towards your hamstrings and your glutes, which is the target area for many people. Elliptical machines are a popular alternative to treadmills which is an exercise machine, typically with a continuous belt, that allows one to walk or run in place. Elliptical machines are great things for workout. With these machine you can workout at home. There’s so many kinds of elliptical in the market but you will have to choose one for your home. 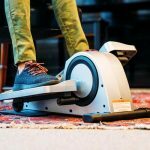 Your article seems pretty informative and this will be a good guideline for those who wants to buy elliptical for their home.